When Richard Hannay returns from a long stay in Africa, he becomes caught up in a sensational plot to precipitate a pan-European war. After the discovery of a corpse in his flat, Hannay flees the attentions of both the conspirators and the forces of the law, and the pursuit turns into a thrilling manhunt. Set against the hot summer which precedes the outbreak of the First World War, The Thirty-nine Steps is one of the finest and most highly admired thrillers ever written. I went into The Thirty-Nine Steps thinking I had seen the Hitchcock movie, but now I'm pretty sure I haven't. I think I own that movie and everything, but my hoarding problems are another discussion altogether. As you can see from the book description, The Thirty-Nine Steps is one of the "most highly admired thrillers ever written". It made it's way onto my reading bucket list after appearing on NPR's Top 100 Thrillers list. The Thirty-Nine Steps probably won't appear on my personal top 100 recommended thrillers list, but I can see why this is an important classic. It gave birth to the innocent man on the run trope of which I happen to be a big fan. I'm glad to have read this book; I think anyone who wants to visit the roots of the genre will get some enjoyment out of it. I don't think it can compete with modern thrillers in terms of action and twists, but it is certainly my kind of classic novel. 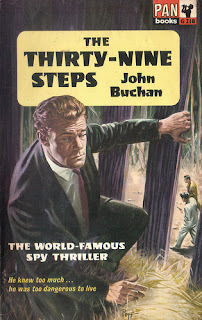 I downloaded The Thirty-Nine Steps for free from Project Gutenberg. You can also download an audio version for free from LibriVox or the Kindle edition for free from Amazon. That's too bad! I've seen this on many best-of lists and have wanted to read it.